The bus that crashed into Sabelo Khumalo’s home on October 21, 2017. A Snathing man is tired of waiting for a bus company to compensate him after one of its buses crashed into his home in 2017. 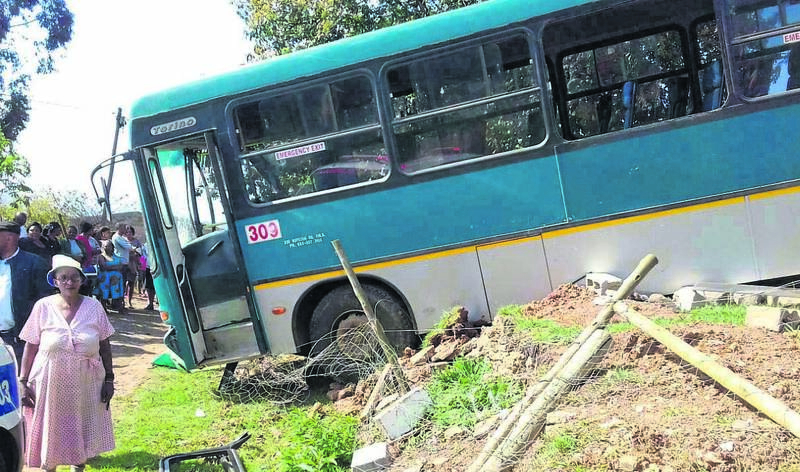 Sabelo Khumalo said a Sizanani MaZulu Transport (SMT) bus carrying passengers crashed into his two-room house in Snathing, Edendale, on October 21, 2017. “The house was totally destroyed. Fortunately, I was not at home when the accident happened and no one was injured but all my assets, including my television, laptop, table and chairs, bed and cupboards, were destroyed in the crash,” he said. Khumalo he had to abandon his house and find another place to rent in the area, but has now reluctantly had to move back home due to financial constraints. Khumalo said he was asked by SMT to submit several documents including quotations for his damaged house and his personal documents. He said he was told that they could not reimburse him for his assets which were inside the house unless he still had receipts for them, which he doesn’t. “It’s just all so frustrating. I feel like I am being punished for their bus crashing into my home,” said Khumalo. Sabera Ally, from SMT, said Khumalo’s case was handed over to their insurers, Customer Loyalty Consultants. “I don’t know for what reason they haven’t paid him because they have asked for every document and he has submitted everything.” Ally referred The Witness to their insurance company for further comment. Leanie Heyns, from Customer Loyalty Consultants, said “Mr Khumalo was contacted by our offices [on Thursday] to discuss his claim. Unfortunately, he has not been able to provide sufficient proof of ownership of the damaged property, but this matter has been discussed with Mr Khumalo,” said Heyns.